Earn up to 1,260 reward points. A mixer and 3-mic combo tailored to drums and cymbals. 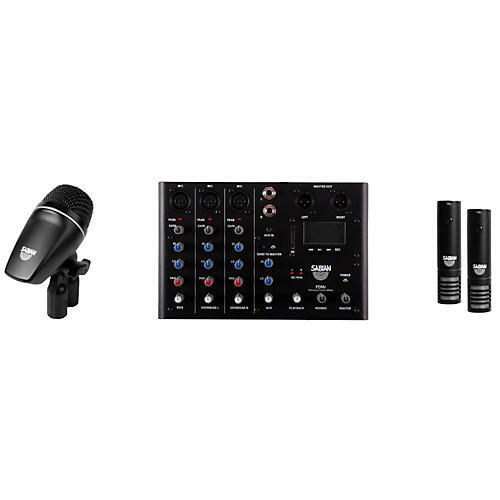 The Sabian Sound Kit is a microphone and mixer package designed to help a drummer dial in his sound. The cornerstone of this set is the Personal Drum Mixer. Available only as part of this kit, this mixer features a Kick-tuned channel, overhead-optimized channels (2) and a high-output headphone amp with 3.5mm and 1/4" jacks. The simple three mic setup for will make for a natural cymbal (preferred) or ambient sound. Also, a line-out will empower a player to use it for live audio applications. This matched pair of overhead mics (SOH2) were optimized specifically for use as drum overheads. Use them to get the best from your cymbals and a big drum sound. Additionally, the SK1 mic was designed specifically for a great kick drum sound. This mic's frequency response is tailored for bass drums and its large diaphragm dynamic design is built for the high-sound pressure levels of today's kick drums. Both the SOH2 and SK1 are also available separately.